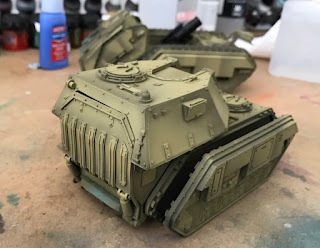 I've decided to start painting some 40k again, so after a long hiatus, I jumped back in and started work on a trio of vehicles for my Death Korps force. 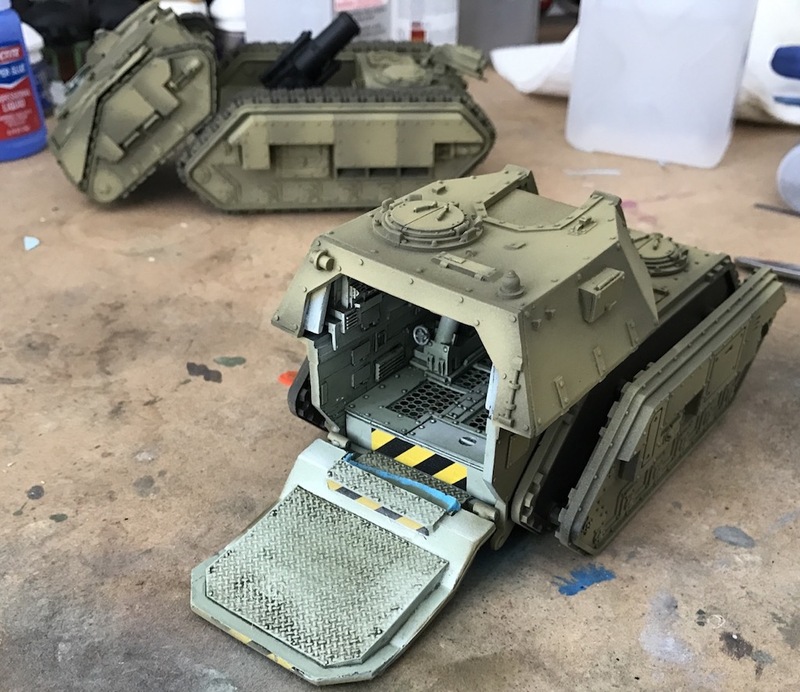 Included in these vehicles is an original Imperial Guard Griffen self propelled mortar. 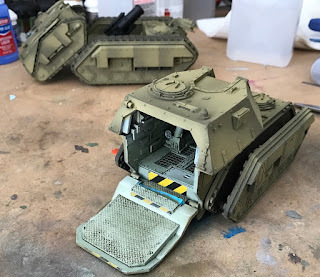 The Griffen will get a post dedicated to it later, as it is one of my original guard vehicles dating back twenty years or so. What I want to discuss here is the Armageddon pattern Medusa. That kit, purchased just a few years ago from Forgeworld, was meant to be a display piece. Unfortunately, the kit is rubbish. 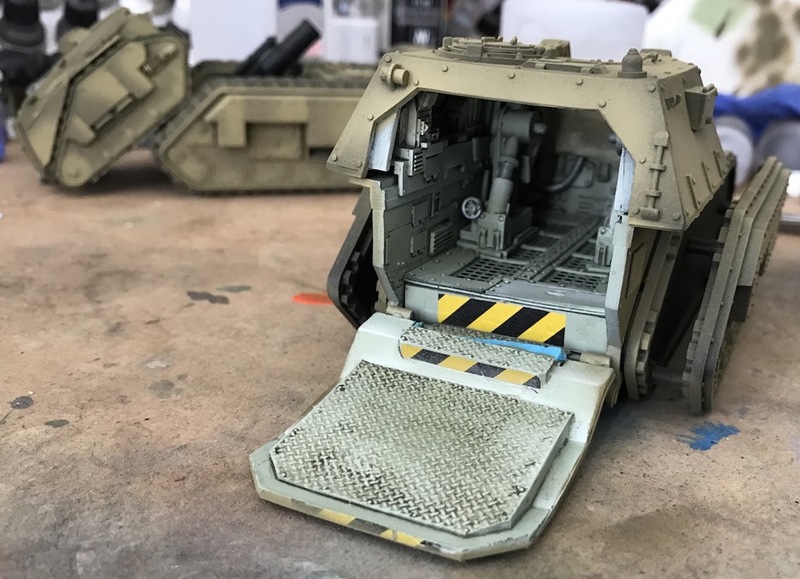 None of the pieces fit together, and the only way I managed to get the brass etch and flooring in was to use a heat gun on the model after I had painted the interior. Then I had viciously chop off detail on the inside. The geometry simply doesn't work. This is a shame. I love the general look of the thing. 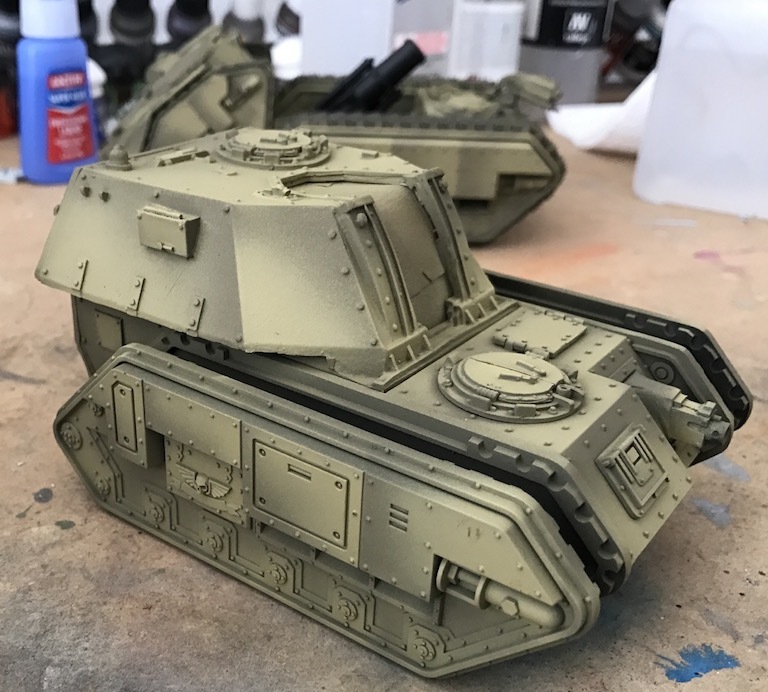 Hopefully it will look like a reasonable AFV when completed. Don't worry about the ramp, It isn't completed yet. I just splashed some paint on it while getting the hard to reach internal areas painted prior to assembly. What on earth is that Centaur doing that Griffen in the background? "Unfortunately, the kit is rubbish." That sums it up. I think this would be easier as a scratch build! Conversely the Ratgard models I've had have been good and one of the one's he does is an artillery piece. Now the ratgard 'site is down but he's still in business. I love the octopus patten on that! I have missed your modulation mastery. Shame about the kid build but loving the look so far. Oh aye, the Armageddon kits that I'd built had tolerances to the nearest half inch at best. Hah! You've done a fantastic job on 'em though - just lovely work! For all the problems you have had with the kit you have made it look good so far. Shame it has been that much effort. I hear ya and feel your pain. Building the Fire Raptor I'm now working on has been rough. Pieces warped all over .. and so much putty. Either way it's coming along nicely.. the heat gun looks like it did the trick! Those tanks are getting randy .. The Armageddon Pattern Basilisk is even worse, mine had a bent gun barrel and nothing held together, i had to make some 'sideskirts' to hide the gap between the superstructure and hull. If my kit were any worse I would turn it into battlefield wreckage! I remember building one of these back in 2009 and had exactly the same issue. I thought the model was really cool, but almost binned it at one stage it was such a pain. You've done a good job here, though! Thank you very much! I don't think people understand how awful these kits are if they haven't built one. This one was almost as bad as my Storm Eagle! I've got some shots of it almost completed in new posts. I am thrilled with how it came out.